Deck Builders have really been on the rise in recent years. From the humble beginnings of games like Dominion, now we’ve even got Marvel and Alien deck builders. I’m really partial to this genre myself. Ascension: Chronicle of the Godslayer (Free) is a game I still log into from time to time and it has never left my phone or iPad. I think the appeal of deck builders comes from having every card you’ll need right in the box. You don’t collect or trade cards and meticulously build your own deck before even playing. You and your friends can play right out of the box with a much smaller financial investment. They’re massively approachable. 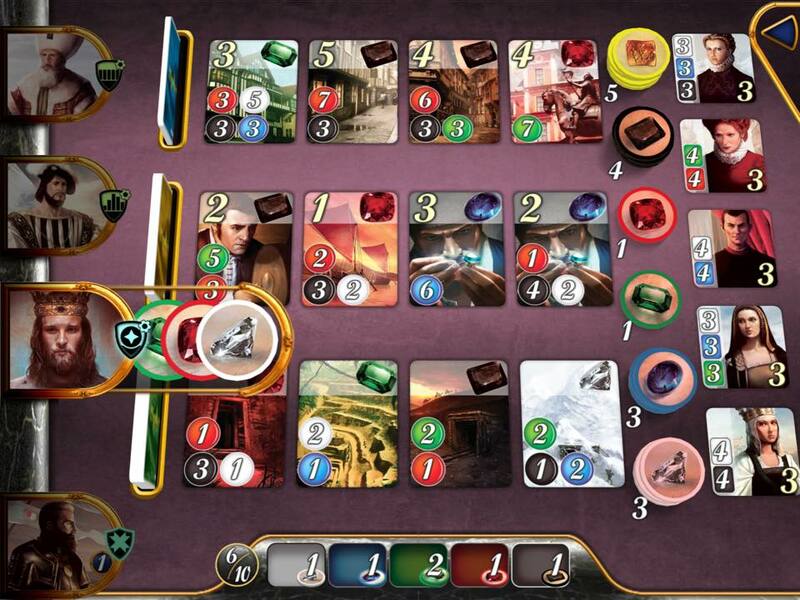 Anyway, the point is, Deck Builders are my jam, and Splendor ($4.99) is a super tasty mixed berry jam that’s won several awards for being so darn tasty. Originally designed by Space Cowboys, Splendor was ported to mobile by Days of Wonder, who also ported Small World 2 ($4.99), Ticket to Ride ($4.99), and Ticket to Ride: Europe (Free). In every case, present game included, the ports were excellent with only a few drawbacks. The theme of this game is shiny things. Mainly jewels. You play as a renaissance jewel merchant, trying to become the most successful and wealthy jewel merchant in the world. As far as themes go, this is far less pronounced than most of the deck builders I’ve mentioned. It’s much closer to Dominion in its simplicity and elegance. But maybe you haven’t played Dominion or any of these games, so how exactly does it play? 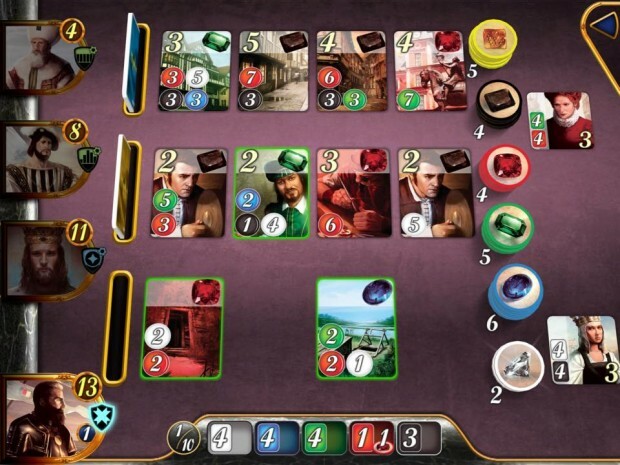 Depending on how many players are involved in a game, between 2 and 4, the various cards will be laid out on the board. 3 rows of cards are drawn from 3 development decks of increasing difficulty/rarity. You’ll also see a limited number of tokens in the five jewel types, and a few gold tokens. The jewel types are Onyx, Ruby, Emerald, Sapphire, and Diamond. The development cards in the middle must be purchased by having the correct number of specified jewels. Each development card itself counts as a jewel, and once you’ve bought it, you get a bonus. These bonuses act as permanent jewels, unlike the jewel tokens, which, once spent, go back into the drawing pool. 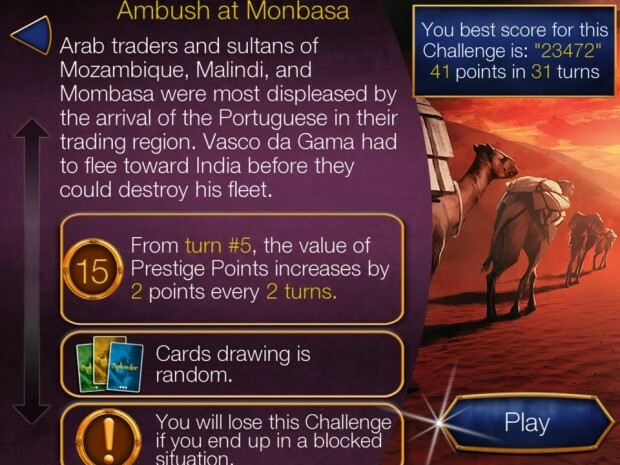 Various development cards offer prestige points, as do the noble cards, which require a specific number of bonuses to eventually win. Your turns boil down to a few options. You can draw up to 3 jewel tokens of different colors, or 2 of the same color, but only if there are 4 or more of that token remaining in the pile, preventing someone from hogging them all. You can also reserve a card, so that only you may buy it. And you may only get rid of it by buying it. You can do this with any card, and when you do, you’ll get a golden token, which acts as a wild card or joker. It can count as any color jewel token for purchasing. If you’re feeling lucky, you can blindly reserve a card from the top of any of the three decks. It’s all very simple, but also very elegant. Because people are fighting over a limited pile of jewels, especially in the early game, every turn matters. It’s not like Ascension, where a turn can be extended and several goals can be accomplished. Turns are very abrupt, and carry a lot of weight. Matches typically last between 8 and 25 minutes, depending on the number of players. On that note, you’ll only be facing the AI or real life opponents in the room with you through Pass and Play. Async multiplayer does not yet exist here, though I’m sure it’s likely to be added if the game does well enough, as the infrastructure already exists in Days of Wonder’s other apps, and Game Center is already integrated. That being said, the single player options are surprisingly diverse, especially with the robust AI options on offer. You can set each opponent to Balanced, Opportunistic, Specialized, and random/special behavior. There are many single player achievements to go after as well, with multiple numbers of opponents. This is nothing to write home about, but for someone who hasn’t played the game much and wants to really learn the ins and outs of it, this is great. The game has even more shelf life thanks to the single player challenge missions. There are 18, divided by 3 settings on the world map. These involve unique scenarios and rule sets, including game types with no opponents at all, and each tells a little story that is allegedly historically accurate for the 15th and 16th centuries. More missions like this could easily be added in the future as well, so there’s more longevity here than is immediately obvious. Days of Wonder has been superb about updating and supporting their games, and that’s true here. This review is about a month past release, and in that time, most of the bugs have already been quashed. They haven’t been eradicated, though. There are occasionally some visual bugs, and bugs regarding buying/reserving cards. They don’t come up frequently though. I should note that the music sets a magnificent ambience and tone, and the visuals are pretty decent too. Sometimes the visuals just kind of clash a little, in my opinion, but that’s no big. You can also turn off the cursive writing and opt for a more standard font using the ‘text for small screens’ option in the menu, which shows a great thoughtfulness. Mainly, I just wish the async multiplayer was here, though with the very blunt and quick turns, I’m not even sure how well that would play out. But that only makes me more curious to see. You might say that 7 dollars is a lot for an app lacking multiplayer, but it is cheaper than the actual board game, so if you already have an iPhone or iPad (Why are you even on this site if you don’t? You silly Billy) it’s definitely worth it. If you are new to deck builders entirely, I’d try some of the free ones or cheaper ones roaming around the app store first, like my main squeeze Ascension, just to get a taste of the general mechanics. It might not even be a flavor thing. You might just prefer jelly over jam.